More than 2.1 million used cars sold in Q3 – a record for the period July-September. Demand for alternatively fuelled vehicles climbs 34.1%, with sales of electric cars surging 94.1%. 6.3 million used cars change hands in the year-to-date – up 7.9% on the same period in 2015. Growth in the used car market continued in the third quarter of 2016 as UK buyers snapped up a record 2,148,050 vehicles, according to figures published by the Society of Motor Manufacturers and Traders. 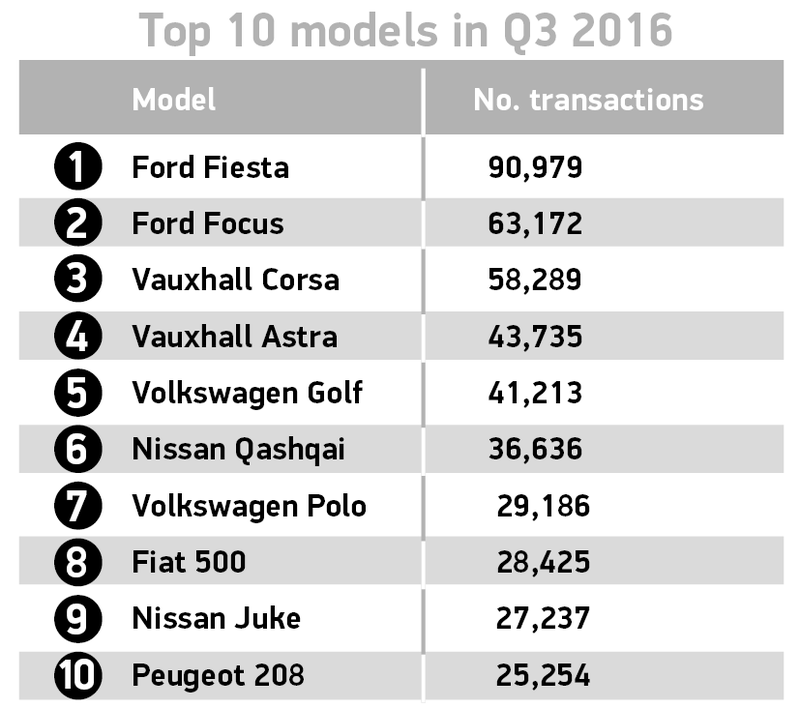 Demand grew 7.9% compared with Q3 2015. Consumer appetite for alternatively fuelled vehicles rose substantially – increasing 34.1% (21,543) compared with the same period in 2015 (16,059). The number of electric vehicles changing hands grew 94.1% between July and September as used buyers made the most of new fuel technology appearing in the used sector. Diesel and petrol fuelled vehicles also enjoyed growth – up 10.8% and 5.7% respectively – as used car buyers begin to benefit from the latest, low emission Euro 6 models now entering the used market in increasing numbers. Meanwhile, the trend towards smaller cars continued, with superminis the best-selling body type (33.8%) followed by family hatchbacks (27.4%) and saloons (13.4%). Buyers in the South East bought the most used cars in the quarter (14.9%), followed by those in the North West (10.6%) and the East (9.8%). Nationally, the Ford Fiesta retained its position as the most popular model, followed by the Ford Focus and Vauxhall Corsa, while cars aged 1-3 years old were most sought after, followed by those first registered 7-10 years ago. 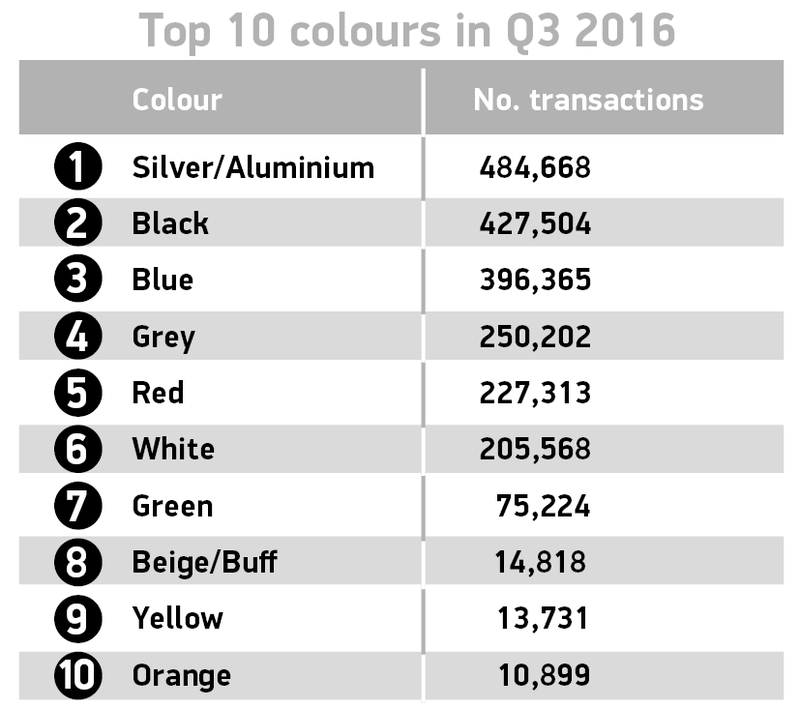 More than 60% of all used cars were bought in silver, black and blue, which remained top of buyers’ colour charts for a second year in a row. Sustained growth in the used car sector is great news for consumers, who have never enjoyed so much choice – whether in brand, body style or fuel type and the range of finance packages on offer makes them more affordable than ever. It’s particularly promising to see the growing demand for electric vehicles filter into the used car market but to encourage greater take-up, a more widespread commitment to charging infrastructure is needed.